In what certainly ranks among the most extraordinary specimens ever unearthed, Pala International has acquired an incredible 10,100 ct. Mogok Burma ruby crystal. No, that is not a typo. This piece really does weigh more than two kilos! Affectionately named “Big Mama,” it is available for viewing by appointment. For the past 11 months, Palagems.com has been reporting on the new sapphire treatment from Thailand and we now have important new information from the AGTA. The AGTA has been working closely with John Emmett and Troy Douthit to study the causes of color in these treated gems, and has just posted the latest findings on their web site at: Beryllium Diffusion Coloration of Sapphire. The Emmett/Douthit experiments were undertaken with high regard to scientific process and were designed to answer the question of exactly what role beryllium plays in coloring these gems. To answer this question, Emmett/Douthit heat-treated high-purity synthetic colorless sapphire in the presence of beryllium. The beryllium diffused into the gem and colored it. What this demonstrates is that beryllium alone, unlike hydrogen, can strongly color sapphire. The experiments provide strong evidence that bulk-diffused beryllium, in and of itself, creates the color changes seen in these treated gems. In our opinion, the latest Emmett/Douthit findings show a clear difference between beryllium bulk diffusion, and the hydrogen bulk diffusion that is a component of traditional corundum heat treatment. While these results are preliminary, we believe if/when they can be verified, they will put to rest most questions on these stones. In cases where the beryllium has not diffused completely through the gem, immersion in 3.32 liquid (di-iodomethane) with diffuse light-field illumination will reveal a yellow-to-orange color rim at and below the surface of the stone. This color rim conforms to the external shape of the gem. The effect is mainly seen in the padparadscha-like pink-orange colors and also some rubies. Where beryllium diffuses entirely through the gem (particularly in yellow to golden yellow stones), the stones are currently unidentifiable except with sophisticated SIMS and LA-ICP-MS methods. To the best of our knowledge, such equipment is not currently on site in any gemological lab in the world. All stones generally display evidence of high-temperature heat treatment. Some stones occasionally display evidence of melted surfaces and recrystallization of synthetic corundum on those surfaces. Burma’s 39th Annual Myanma Gems Emporium ran from March 5–11, 2002. 485 foreign buyers from 11 countries attended, along with 234 local merchants. Most foreign buyers were from China, Hong Kong, Thailand, Singapore and Japan. Ruby buyers came mainly from Thailand. 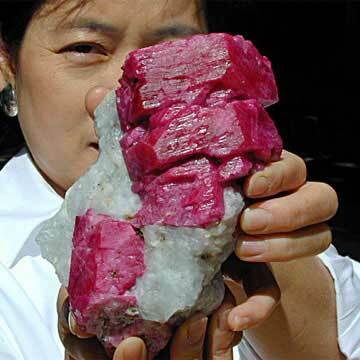 Virtually all of the ruby lots came from the Shan State mines at Möng Hsu. The two biggest ruby buyers were both from Thailand. One lot weighing over over two kilos sold for over $1 million, while another of 4663 cts. also sold for over $1 million. Lots valued at less than $10,000 are sold by tender, while those with higher reserves are sold via auction. As with most things official in Burma, it is hard to make much sense from these figures, particularly since they do not account for any of the goods smuggled from the country. We certainly have not seen the reported increase in sapphire production translate into increased availability of Mogok blues. Other Burma notes. From what we can see, production of both ruby and sapphire from Mogok continues to decline, while that from Möng Hsu is steady. Indeed, the only thing that keeps prices for untreated Mogok ruby from ascending is the prevalence of treated material from Möng Hsu. Mogok material is actually hit with a double whammy, for the treated Möng Hsu material is on the whole a richer, purer red. Many people, exposed to the richer treated color of Möng Hsu, have unrealistic expectations for the untreated Mogok stone. Expectations that simply cannot be met. The following was provided to us by our friend, Rob Lavinsky of iRocks.com. We have also received several of these orders from Indonesia, the Philippines and Romania and so caution all who are doing business via mail order to beware. EXPANDED NOTE TO ALL DEALERS: In the past several days since I posted a warning note, I have heard from over a dozen people hit by this crime and I almost lost 12K myself, and so I am expanding my message here in the hopes that word will spread. A ring of credit card thieves from Indonesia has been trying to purchase gold and gem crystals, gem collectibles, etc., using stolen card numbers. Beware of large orders of such items! These are convertible goods and they will then pawn these items for cash, leaving you to eat the monetary damages! Once the legitimate cardholder reports the fraudulent use of the card, they will get a refund and 60-90 days later the credit card company will withdraw the funds from your account. YOU are liable for the money if you did not verify the cardholder's identity first by confirming the billing address, as per the most recent VISA/MC regulations and recommendations. They have computer-predicted numbers only, and do not have the billing address info needed to assure that the numbers are legitimate. If you have any doubts, ask the customer to confirm billing addresses and then call the cardholder's bank to confirm that the card really belongs to that owner, particularly when the order is from Indonesia, Singapore, the UK, and Romania (this info according to MBNA Bank's loss prevention department, whom I called recently). Several of us have been hit by a "gentleman" named Ikwan using aliases such as "johnny panther" and "andy jesus". Apparently, they run small charges of pennies to $1 on thousands of predicted numbers until they find a "hit," and then use that valid card number for purchases, even while the owner never notices the test charge that went through. They will use the cards to order $2500-3000 at a time, and spread large orders over 4-5 cards! You will get the money because the cards ARE good… they do not come back with a fraud rating until reported. However, the money will just be taken away later. Better to be careful now. The bank reps that I talked to were COMPLETELY resigned to this as a perennial OLD problem, that is new only to us. They were totally unsurprised when I called. FOR SECURITY, VISA/MC now encourages card acceptors to confirm billing address of customers with each transaction, for the best discount rates and for maximal protection against card fraud. I personally participate in this program, despite the slight extra bit of time it takes to run charges. It is obviously worth the slight additional time required! TO CUSTOMERS, PLEASE NOTE THAT THIS PROBLEM HAS ABSOLUTELY NOTHING TO DO WITH YOUR PERSONAL DECISION TO SPEND MONEY ON THE NET OR USE CARDS FOR ONLINE ORDERS! THESE CRIMINALS ARE NOT GETTING THEIR NUMBER FROM VENDORS YOU HAVE SHOPPED WITH ON THE WEB, BUT RATHER BY COMPUTER PREDICTION OF VALID NUMBERS AND TRIAL & ERROR. ANY CARD INFORMATION YOU PROVIDE TO ME (AND TO MOST VENDORS) IS COMPLETELY SECURE, AND I VERIFY ALL BILLING ADDRESSES PRECISELY FOR THE REASON OF AVOIDING SUCH FRAUDULENT USE OF YOUR CARD NUMBERS. THIS SITUATION IS A PROBLEM FOR DEALERS... WHILE THE CUSTOMER IS FULLY PROTECTED BY YOUR CREDIT CARD PROVIDERS, WE ARE NOT. We knew this credit card problem existed, but had no idea how widespread it was. After sending the above message out to our subscribers, one dealer phoned us and said he was just getting ready to mail out $10,000 worth of goods to Indonesia when our message arrived. One of the best tips we’ve heard is that the seller request that the buyer fax copies of the front and back of the credit card for verification. Another is to call your bank that processes your credit card orders and request a verification that the shipping address is indeed the billing address of the card. Within an hour after receiving your email, we did receive an email from Indonesia from a gentleman asking if we can send a 1ct RBC, D, VVS1 diamond w/ a GIA report to Indonesia. He indicated that he'll be paying w/ a credit card & was most anxious in shipping the stone via Fed Ex immediately. Suspiciously enough, he wasn't even concerned about the cost of the stone, just if we can send it to Indonesia immediately. Thank you very much for your email, that was a close one! Hallo, Thank you for the mail. In Germany we know this problem in a different way. Here, people from Great Britain call via phone or fax the jewellers and ask for exclusive watches. They say or fax the credit card numbers. Its a so called "mail order". All cards a duplicated in GB. The calling people come from Nigeria or the Ivory Coast staying in GB. The jewellers lose the money. From Germany we can’t get the people in GB because they do nothing wrong in GB only in Germany! I got popped for $8560.00 last year on a fraudulent charge. I sold a set of (2.10ct tw) diamond earrings. The credit card company came after me -6 months after the charge. I had no idea that they could do that. With the diamond earring cost and attorney's fees I had to shell out $14,760.00. I try to tell everyone I know in the industry (or out!!) about the fraud situation. Most people think that the merchant is covered by "insurance" from the credit card company. One other variation I've noticed on one or two of the orders we received from Indonesia, where they actually gain access to the card holders billing information as well as the number and expiration date. We've reprogrammed the fraud parameters on our credit card processor to help but still an occasional one gets through. One thing we've done that helps with questionable overseas orders that Cardservice suggested is if any doubt we ask for a FAX of both front and back of credit card and a note saying it was authorized. No actual cardholders have ever objected when we explain in email our reasoning behind it and also explain it protects them as well as us (the merchant). and since we did that no chargebacks. Thanks for the warning but we knew this 4 years back, what is best is to always call your bank and get the phone number of the issuing bank and check and see if the card is hot or if the address is the right one, as AVS only works in the US. Unfortunately, it is a perennial problem for us too. While most of our business is wholesale to retailers, we do a good amount of direct selling to consumers who see our jewelry in magazines. To date, we’ve never been burned, but we’ve come close. American Express is in our opinion the most reliable and easiest to work with as far as verifying addresses and purchases. Since so many banks administer VISA and MasterCard, it’s not always as easy to verify the purchaser’s identity when they use those particular cards. All to often, the temptation of wider margins made through retail sales can blur our better judgment. We also get many calls from Malaysia and Russia. Seller beware. A group of four major gem labs (GIA, AGTA, SSEF and Gübelin) issued a statement on the new treated orange sapphires, declaring them to be treated, but refusing to use the term “surface diffusion.” Reaction from US traders has been decidedly lukewarm, as many do not believe it goes far enough in protecting consumers. In summary, the data obtained in this investigation strongly suggest that something is being added to the corundum to account for the surface-related orange color layers. Additional research is needed to confirm these results, and it is our intention to test more samples from a variety of sources to get a more complete understanding of the process involved. In a November, 2001 GIA study, a variety of gems were subjected to radiation similar to that proposed by the US Postal Service for mail decontamination to prevent anthrax attacks of the kind that occurred post-Sept. 11. The results were, to put it mildly, not good. The GIA has issued a preliminary report on the new treated orange sapphires. You can read the report at this link, and we strongly suggest that it be read in full. Several weeks ago we reported on a new treatment process in Thailand for Songea (Tanzania) orange sapphires. We have now had a chance to examine a number of these stones from both Songea and Madagascar and they appear to be treated by a process involving heat and/or surface diffusion. Indeed, a combination of treatments is possibly involved. Inclusions within the stones indicate that all have been exposed to high-temperature heat treatment. But some display features suggesting more. The AGTA lab in New York is currently studying these stones, and their initial report can be found at this link. We have provided a number of specimens to the GIA for analysis and will report on their findings as soon as we have them. Color ranges and types. The end color range of these goods runs the gamut from yellow through golden yellow, to orange (including the range that encompasses padparadscha) and even into borderline ruby colors, some of which resemble red spinels. What initially began as a treatment for Songea sapphires has now spread to Madagascar pink sapphires, Thai/Cambodian rubies and even green sapphires from Australia and elsewhere. Pink stones are treated to oranges (including padparadscha colors), green sapphires are reportedly being treated to golden colors, and poor color Songea orange sapphires and purplish Thai/Cambodian rubies treated to better, redder colors. Irradiation? We don’t think so. Initial reports reaching us said that some stones were possibly undergoing irradiation and that the color was unstable and would fade with prolonged light exposure. Shane McClure of the GIA has pointed out that such irradiation would not color an entire stone’s surface equally, which is what appears with many of these new stones. Reports on initial fade tests have also resulted in no loss of color. Thus we believe that initial reports suggesting irradiation might be involved were incorrect. It now appears unlikely that the stones such as those pictured here have been irradiated. Surface-diffusion treated? Possibly. An unusual characteristic in some stones is a surface-based orange color layer surrounding a pink core (see photos below). Superficially, it resembles surface diffusion. But unlike normal surface-diffusion treated gems, the facet junctions and girdle show no highlighting. Instead, what is seen is a layer of yellow-orange that follows the shape of the cut stone exactly. This suggests that at least the final portion of the treatment is applied to the cut stone, rather than the rough. More than five different sources have now independently reported to us similar orange rims on rubies, in addition to the now-common orange rinds on orange sapphires. Apparently burners in Thailand are taking poor-color Thai/Cambodian rubies and improving their color via this added orange color rind. Recutting? Exercise caution. We attempted to recut one emerald-cut orange stone, but stopped after serious color loss was noted. Another source reported a similar loss of color during recutting. In other stones, the color appears to go all the way through. have reported recutting these color rind-free stones with little or no loss of color. Other labs have issued natural reports. A number of people have contacted us with information that other labs have issued reports declaring these stones to be natural with normal heat treatment only. We are aware that other labs have issued reports. We have read the online reports of Themelis.com, GRS and GIT and have been forwarded press releases from Thaigem.com and others. The initial Themelis report suggested a synthetic overgrowth of orange sapphire on a pink sapphire core. We find no evidence of this. [Note: the initial report has since been revised] The GRS and GIT reports (including the latest updates as of Jan. 31, 2002) suggest an alteration of the valence state of iron as the cause of the orange rims. Our discussion with other scientists here in America suggest that this may not the case. According to the information to which we are currently privy, for iron to produce a yellow color in corundum, iron substitutions on the order of 2–3% are required. This is not being found in these stones to the best of our knowledge. One of the problems is that, according to what we have learned, the most likely coloration agent, Mg, is virtually undetectable at the levels of suspected involvement (tens of parts per million). Thus even well-equipped labs such as GIT, AGTA or GIA may not be able to find the Mg. The fact that slightly elevated iron levels are being found may even distract from the real colorant, which may be undetectable. A second problem is that, again according to our current understanding, so little Mg may be required for this treatment that burners may not even be aware that they are diffusing Mg into these stones. A detailed description of Mg and Fe coloration in corundum can be found in the following reference: Emmett, J.L. and Douthit, Troy R. (1993) Heat treating the sapphires of Rock Creek, Montana. Gems & Gemology, Vol. 29, No. 4, pp. 250–272. What to do? The jury is still out on these stones regarding the exact method(s) of treatment, cause of coloration and their long-term color stability. As more information arrives, we will provide updates. For the moment, we advise extreme caution in the purchase and sale of these stones. Sources from Thailand are reporting development of a new heating process for dark orange-red sapphire from Tanzania’s Songea district. The process has apparently been developed by a burner in the Thai gem trading town of Chanthaburi, and the material has been selling in that market since early September, 2001. The process apparently involves heating material that previously did not respond well to treatment. Resulting colors run the gamut from a bright red reminiscent of Burma red spinel, through orange reds, to a pure orange. Golds and yellows are also reported. Meg Berry, Pala’s champion gem cutter, has won yet another award, taking home 2nd place in the “Pairs and Suites” category for the AGTA 2002 Cutting Edge Competition. Her winning cut was a “Trio of Trillions”, two 2-ct. pieces of canary yellow tourmaline in a windmill cut and one 4.60 ct. spessartine garnet in a double windmill cut. The stones will be displayed at Tucson 2002 and the trophy will be awarded at the AGTA dinner dance. Congratulations, Meg! A new jadeite mine has reportedly been found in the Hkamti region in Upper Burma. Union of Myanmar Economic Holdings Ltd. (UMEHL) has apparently obtained permission to produce jade from the mine, a source from the Indo-Burma border reported. UMEHL is the Burmese military’s business arm, with most shares being owned by military officers. A group of military officials, including State Peace and Development Council Secretary (3) Lt. Gen. Win Mint, the commander of North-West Command and four other ministers reportedly visited the Makyankha Mine near Makyankha village in Hkamti township on October 27, 2001. Permits for this new mine were reportedly issued to the UMEHL, which has reportedly taken 63 mine areas and is scheduled to begin jade production on November 1, 2001. The mine was said to have been found last December when villagers from Namsi Bum came to the area and dug a fire pit to produce charcoal. After they found jade, other villagers flocked to the area to dig. Soon after, the mining area was closed by military order. Burma holds several gem auctions each year. At the at the country’s 10th Mid-Year Gems Emporium, which ran from Oct. 7–14, 2001, Burma fetched a total of US$9.556 million through sale of locally-produced gems, jade, pearls and jewelry under tender and competitive bidding systems. The eight-day state-sponsored gem emporium attracted 302 foreign buyers (mostly from mainland China, Hong Kong, Thailand, Japan and Singapore), and 314 local buyers. However, the foreign exchange earning of this year’s mid-year gem emporium was 42% less than that gained in last year’s event, due to the slowdown of the global economic growth rate and the September 11 terrorist attacks on the United States. The small Chinese border town of Ruili in Yunnan Province is one of the major transit points for Burmese goods into China. Such goods include legal items, like jewels, and illegal products such as timber, opium and heroin. Richard Hughes found an active gem market in Ruili, with perhaps 500-1000 people daily involved. Most of the trade is in Burmese jade, with only tiny amounts of other gems available. Fine jade was in short supply, with most being of commercial quality. Ratanakiri. Reddish brown zircons which can be heated to produce a blue color are found in Ratanakiri province at two localities. The first and oldest mines are near Bo Kheo. These mines are largely abandoned today. Another deposit has been located in the third district, about 50 km. north of Banlung, the biggest town in the province. This deposit was supposedly discovered by the district supervisor about 3-4 years ago. It had about 2000 people working it at the time of Richard Hughes’ visit, with the gems mined from an alluvial layer about 5-10 meters below the surface. While miners reported that only zircon is found there, older reports on the zircon mines in Ratanakiri suggest that the occasional piece of ruby and sapphire are also unearthed. Pailin. The historic mining district of Pailin, located in Battambang province near the Thai border, features ruby, blue, green and yellow sapphire, reddish brown zircon and red garnet. Formerly the last bastion of the Khmer Rouge, Richard Hughes found some 5000-10,000 people actively engaged in mining and the allied trades at Pailin. Pailin ruby and sapphire is mainly in sizes of 3 cts. and less. The sapphire generally runs $500/ct. and down, while the ruby, which is identical to the Thai stones from across the border, sells for prices identical to Thai ruby. Preh Vihear. Yellow sapphires are being mined in Preh Vihear province of northern Cambodia, near the Thai border (probably opposite Si Sa Ket/Ubon Ratchathani). Richard Hughes saw fine faceted pieces in Phnom Penh in sizes up to 2 cts. Some corundum is also found on the Thai side of the border. Tachilek/Möng Hsu Ruby. The Thai border at Tachilek/Mae Sai, closed since Feb. 11, 2001, has reopened. This crossing is an important crossing point for gems, particularly Möng Hsu ruby. While rumors continue to circulate that production of Möng Hsu ruby is down, the large quantities (in the tons) of rough available at recent govt. auctions in Rangoon suggest we will not be seeing any shortages soon. Nanyazeik (Nayazeik). The ruby/red spinel mines at Nanyazeik in Kachin State continue to produce. Mining is taking place less than 1 km north of the village of Nanyazeik, which is located on the Mogaung-Hpakan road in Kachin State. Many of the miners at Nanyazeik have reportedly moved there from the Kadoktut area of Mogok. Kadoktut’s workings, which are part of a long crack in the limestone several kms. in length, were abandoned due to dewatering problems. In Rangoon, Richard Hughes saw a 3-ct + faceted ruby of slightly purplish red color from Nanyazeik, along with faceted red spinels close to 10 cts. Tanai. In addition to Nanyazeik, another gem deposit is said to exist at Tanai, roughly 33 miles north of Hpakan in Kachin State. Ruby, sapphire, spinel and diamond (yes, diamond!) are said to be found there. The situation in Burma continues to deteriorate. Rationing of gasoline, electricity and cooking oil is now occurring due to a foreign exchange crisis. In addition, anti-Muslim rioting is spreading to Pegu (80 km. north of Rangoon). This is in part a backlash by the majority Buddhist Burmese against Muslims because of the destruction of Buddhist statues in Afghanistan by the Taliban. Rumors continue to circulate that the military junta is planning to introduce new 10,000-kyat notes. This is helping to fuel inflation. Introduction of new 500 and 1000 kyat notes in the past caused commodity prices to quickly double. Residents are said to be now transferring their cash into luxury goods (including gems & gold) and real estate as a hedge against future instability. At Burma’s recent gem, jade and pearl emporium, sales totaled US$10.12. This was a 58% drop from the previous year, which had set a record. Such sales have been held annually since 1964, with additional mid-year sales added in 1992. Over the years, sales have totaled US$330 million, according to official statistics. This year, 674 buyers attended. They came mainly from Thailand, Hong Kong and China. The Burma-Thailand border crossing at Tachilek/Mae Sai remains closed, with fighting continuing between the Burmese army, backed by their Wa allies, and the Shan State Army. Mae Sai is an important trading center for Möng Hsu rubies from Burma. It is also near to major drug trafficking routes, which is said to be the reason for the current fighting. Shan rebels are said to be blocking the Burmese/Wa military from moving their drugs through the area. On Sunday, Feb. 11, 2001, a pitched battle was fought at the Burmese border town of Tachilek, opposite the Thai town of Mae Sai. The battle pitted the Shan State Army against the United Wa State Army and Burmese regular army units. After a number of shells landed on Thai soil, Thai military units retaliated, producing turmoil at the important ruby-trading outpost of Mae Sai and leaving the town deserted. According to some news reports, this battle resulted from conflicts over drug trafficking routes. The situation came to a boil when the Burmese army occupied a Thai paramilitary base on Feb. 8, reportedly because it was an obstacle to drug caravans. Over the past several years, Thailand has faced an onslaught of methamphetamine from jungle labs operated by Burmese military allies, the United Wa State Army. The border remains tense, with both sides reinforcing their troops. Just how this might affect the border ruby trade remains to be seen. We suspect that interruption will be minimal. Rubies, like drugs, are easily smuggled and tend to find their way to market no matter what the obstacles. The Burmese currency is reported to be weak and losing value daily. In late January, the Kyat fetched 430 to the dollar, down from 375 six months ago. Over the past few weeks, it has dropped to near 500. The weakness of the Burmese economy is reported to be at the heart of the military junta’s recent overtures to opposition leader, Aung San Suu Gyi. Western sanctions against the military regime are also said to be biting deep, cutting potential foreign investment and aid. Coupled with the deteriorating economy, the situation is not good. Richard Hughes visited Thailand’s Chanthaburi gem market a week ago and found business to be very slow. The origin of the few fine sapphires seen in Chanthaburi was Madagascar, while a few smaller Möng Hsu rubies were also on offer, but generally the pickings were slim. The only Nigerian spessartine and rubellite seen were of low quality, confirming that these deposits are largely worked out. Pala International still has a fine stock of these gems. Get them while you can.